When starting a family, most people are aware that there will need to be changes to the way you live and work at home, but this doesn’t always have to mean compromise. Embracing the new change in your home doesn’t mean going without something else. There are plenty of considerations, yes, we’ve got a few ideas and tips to keep in mind that we, as Islington architects, always undertake when designing a home with children in mind. Play spaces are often poorly considered when designing for kids. Many people assume that play spaces are unnecessary because sooner or later, your children are going to grow out of it. However, these spaces should be flexible to allow for growing over the years, becoming new spaces for your family to enjoy. They should react and change to our needs, and, if planned properly by Islington architects, this can easily be done when the time arises with some simple cosmetic changes. If appealing to your children for their entire childhood isn’t worth a week’s worth of renovating, then what is? Think of how you can let your kids play with their toys without cluttering the rest of the home. Places to play hide and seek or dedicated spaces under furniture for their toys is a fantastic idea to get started with designing a home with children in mind. Storage areas are also important. Although many parents recommend getting rid of things such as toys when your kids grow older, we all know that toys hold sentimental value for your kids and it’s best to keep them until they can make their own decisions. This means that you’re going to need storage space specifically for things like toys, old books and games that they may or may not grow out of. Book shelves and chests are a great idea, but you can expand on this by building storage into furniture or having storage underneath the floor or in the walls. We cannot forget about designing a child’s bedroom when building a home for a family. A child’s bedroom should reflect their personality and not just the parents wishes for them, it should be filled with memories but still move ahead with future plans and goals. You can coordinate your child’s bedroom in the future with different kinds of wallpapers and bed linen to match their interests, but if they’re still young then keeping a neutral palette will help them to grow in to it. Just keep in mind that you’ll need to renovate the bedroom several times to give your children the best childhood experience you can. Your child’s bedroom will evolve several times throughout their childhood, so be prepared to drastically swap the decor and furniture multiple times. With this in mind, remember to start small, utilise storage and keep it clutter-free to accommodate frequent changes. We always consider this, as Islington architects, when designing homes. We also can’t forget about safety. For example, when your children are still young, they’ll likely crawl around and they’ll be at the exact height of power outlets and plugs. Because of this, you’ll want to either hide these outlets with furniture or at least cover them with safety measures. You’ll also want to worry about safety on stairs and landings. Child-proof gates can protect your kids from these dangers, but you’ll also want a safety gate in their nursery as well. You should also consider safety when it comes to kitchen cabinets and doors that slam due to air pressure. As you can see, it doesn’t take much to start designing a home with children in mind. The most important thing to remember is that your home will evolve and grow together with your children. Their bedroom will change several times a year according to their latest tastes or needs, and you should learn to accommodate this by planning your decor and furniture ahead so that it can easily be swapped out. The other important concern is safety and security. From baby monitoring features to nightlights and even child-proof gates, there’s a whole host of products that can be used to keep your children safe when you’re not looking. It will give you peace of mind, protect your child and make your home a much safer place. We have designed and built many homes and home extensions in Islington. 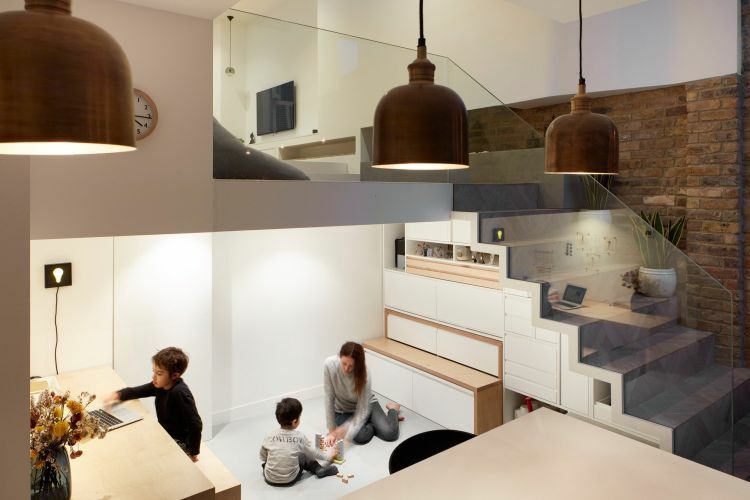 As Islington architects, we’re often challenged with making a space more appropriate for the family living there. By listening carefully to their needs and making small adjustments to the design, we can incorporate concepts in to the scheme which bring delight to the family living there. This can grow over time, and change as needs change, but ultimately the same design can be used for many years without the need for large alterations. Speak to us today to see how we can help you.